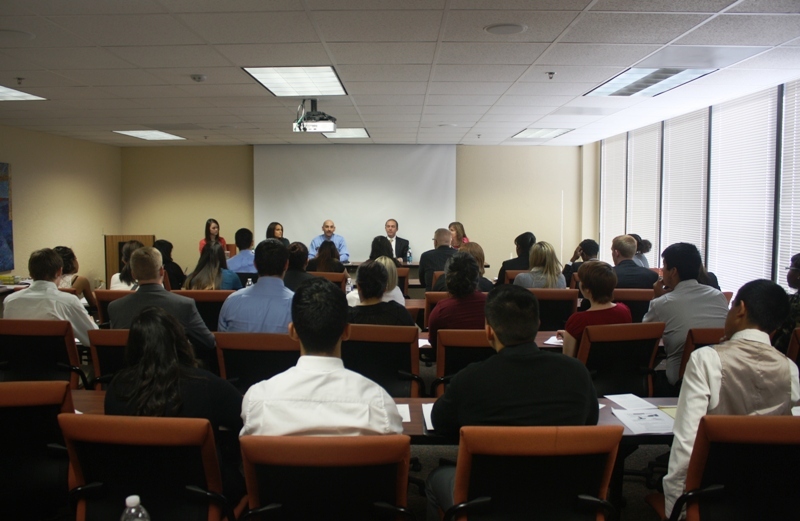 Almost fifty students attended the Law School/Grad School Seminar hosted by the Center for Law, Engagement, And Politics (LEAP) earlier this month. 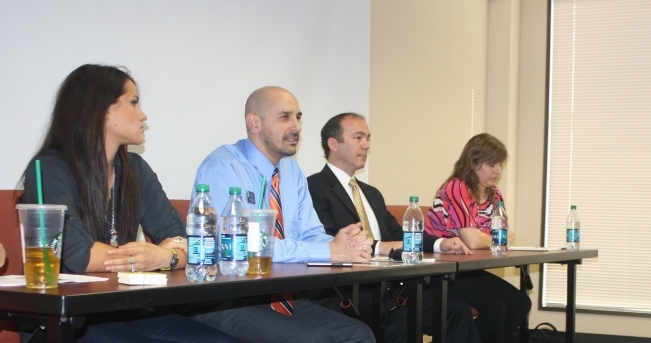 The seminar featured Karissa Morissey from Princeton Review; Stephen Perez, Dean of Students at Texas Tech Law School; Kathryn Meyer, Director of Recruitment from the Bush School at Texas A&M University; and Thomas Leeper, attorney with Smither, Martin, Henderson, and Blazek. The LSAT should be taken approximately a year prior to when the students wants to enroll in Law School. The Princeton Review offers Prep Courses at SHSU in the spring of each year. Dean Stephen Perez stressed the importance of the LSAT Scores and a student’s GPA, while pointing to Tech’s strong rates on bar passage, employment, and the excellent performance of students in Moot Court and Mock Trials. Also, the National Jurist magazine ranked Tech among the top 10 in the country in both “overall value” and “student satisfaction.” Perhaps not surprisingly, more SHSU students are enrolling in Tech, with four Bearkats matriculating last year. 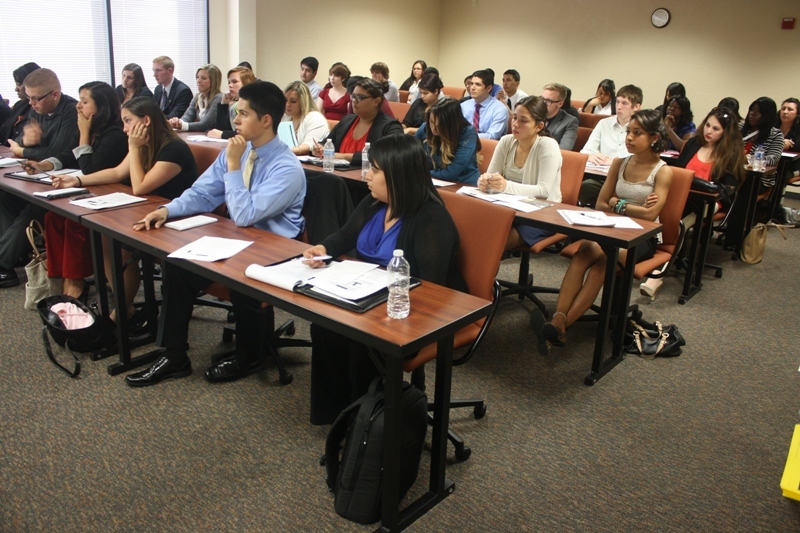 Dean Perez seems to be intent on duplicating that success this year, offering the students who attended the seminar fee waivers to apply to Texas Tech. Kathryn Meyer caught students’ attention when she discussed the programs of the Bush School of Public Service. The Bush School is a top 35 Public Administration across the country, featuring broad programs in Administration and International Affairs and endeavoring to keep students’ costs low. SHSU boasts more graduates at the Bush School than any other University in the nation with the exception of Texas A & M.
Thomas Leeper’s discussion bridged both law and public affairs. Leeper has served as an attorney in private practice, a city attorney, and a political appointee. Leeper discussed life in law school (giving particular attention to the Socratic Method), the kind of work that attorneys do, and the importance of public service.